Congratulations to the new librarians! The passing rate for the Librarians' Licensure Examination is 27 percent (191 out of 699), down from 30 percent in 2009. Below are the list of the Top 10, as well as the list of all successful examinees. Both were taken from ABS-CBNnews.com. UPDATED 19 November 2010 to include the table detailing the passing rates for all the schools (pdf) represented at the exam. The file is from the official website of the Professional Regulation Commission (PRC). For trends during the past three years, see "The Best and the Worst LIS Schools, 2007-2009." For showing exemplary dedication, competence and integrity in the conduct of her profession having served for thirty four (34) years and having rose from the ranks to Chief Librarian until her retirement from the National Library of the Philippines; for contributing significantly to the advancement of the profession and for her significant involvement in various professional organizations that pioneered the passage of Republic Act Nos. 6966 and 9246 otherwise known as "The Philippine Librarianship Act"; for continuously honing her expertise and professional competence through attendance in seminars, training and conferences here and abroad including services rendered in the National Libraries of Nigeria, Singapore and San Diego, California, USA to benefit the country; and for her meaningful contribution and selfless involvement to the various outreach projects of the Association including bringing books and updating library facilities in Mindanao which earned her the PLAI Cirilo B. Perez Award. Thanks to Lilia Echiverri for providing the citation. The photo is from Fe Abelardo's Facebook album, and is used with her permission. 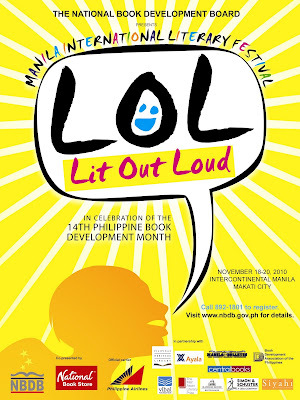 In celebration of the 14th Philippine Book Development Month, the National Book Development Board, in partnership with the Filipinas Heritage Library, National Book Store and Philippine Airlines, will present the 1st Manila International Literary Festival. 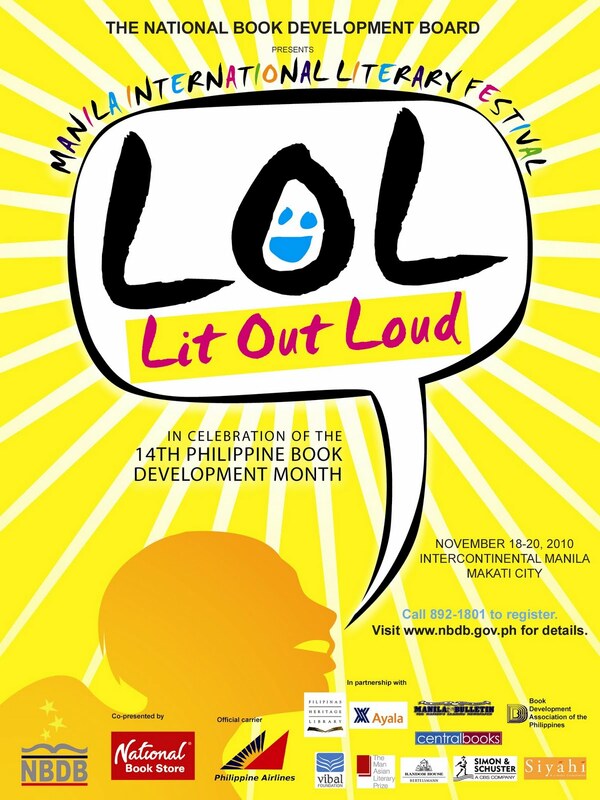 In a three-day festival, LOL: Literature Out Loud will bring together a large community of writers and readers, students and teachers, as they face traditional and emerging concerns in literature. Together with local and international writers, publishing experts, teachers of literature, as well as followers of various genres of writing, the NBDB hopes to create a continuous dialogue on literature and reading. Among the foreign writers who will attend the festival are Vikas Swarup, whose novel Q&A has been adapted into the Oscar award-winning movie Slumdog Millionaire; Christopher Cheng, who has published critically acclaimed books of fiction and nonfiction for young adults and children; Andy Mulligan, author of young adult novel Trash; literary agents Mita Kapur (also the author of the F-Word) and Jayapriya Vasudevan; and David Parker, the chair of the Man Asian Literary Prize. 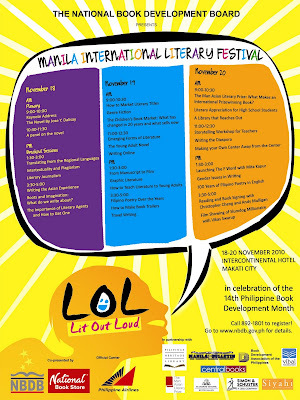 The festival will begin with a keynote speech from Jose Y. Dalisay Jr., award-winning novelist. The many local writers also joing us include National Artists for Literature Virgilio S. Almario and Bienvenido Lumbera, Cristina Pantoja Hidalgo, Gemino H. Abad, Alfred Yuson, Resil Mojares, Marjorie Evasco, Ricky de Ungria, J. Neil Garcia, Isagani Cruz, Merlie Alunan, Criselda Yabes, Susan Lara, Angelo Lacuesta, Jr., Ralph Semino Galan, Tara FT Sering, and many more acclaimed Filipino writers will join the Festival. Scheduled are several break-out sessions, with topics ranging from literary criticism to publishing will be discussed. The last afternoon of the festival will be dedicated to book and poetry readings, book signings, and book launches. Click on the image below to see the schedule. LOL: Lit Out Loud! 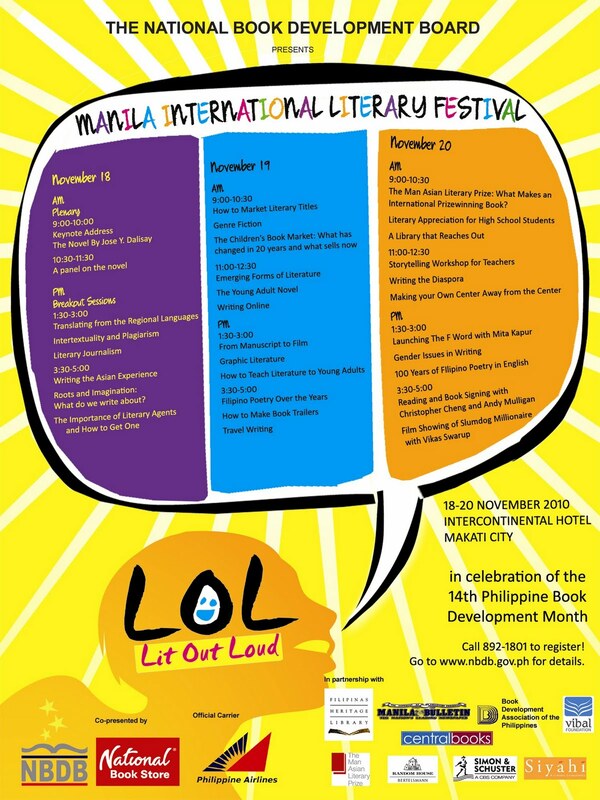 is also done in partnership with the Manila Bulletin, Filipinas Heritage Library, the Ayala Land, Inc., the Book Development Association of the Philippines, Central Books, Man Asian Literary Prize, Vibal Foundation, Random House, Simon and Schuster, and Siyahi Literary Agency. To register, call 892-1801; for details, call 926-8238.